Our problem: The kids were begging for a pet. We wanted them to have one, but I'm allergic to everything with fur and feathers. What were we do to? Our solution came in the form of a tortoise. According to a breeder I met, tortoises know their names. They respond when petted. They're curious and communicative. They're non-allergenic! My family recently added two young redfoot tortoises to our household, and we couldn't be happier. 1. Pick the right breed. 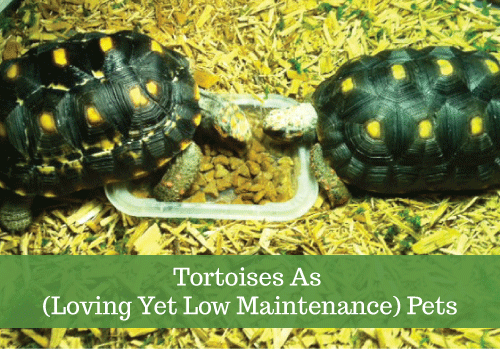 Different tortoise breeds require different kinds of care. For example, Leopard tortoises require a dry, hot environment while Russian tortoises need to hibernate a few months a year. Make sure your family can provide care to keep your tortoise healthy. A great online learning resource is Tortoise Forum. 2. Plan for a long commitment. Tortoises in captivity can live 50 to 60 years. Our children, who are adopted, love the idea of bringing their tortoises with them when they move out--in other words, keeping a family member with them. 3. Buy from a breeder, not a pet store. Home-raised tortoises are less likely to have been exposed to salmonella than store-raised tortoises, and they'll be more likely to enjoy interacting with with people. Find them through The New England Herpetological Society or Tortoise Forum. 4. Find a tortoise-friendly vet. Not all vets know about reptiles, and not all reptile vets know about tortoises. Ask a tortoise breeder, check the online resources above, then read reviews. 5. Set up properly. The only complicated part of tortoise care is putting together their habitat. Make sure they've got a large enough terrarium with the temperature, humidity, light, and nesting materials appropriate for their breed. 6. Pay attention to them. Tortoises are more intelligent than most people give them credit for! If you interact with them, they'll interact with you. 7. Remember that tortoises are wild animals. Respect their love of sweet berries, their fear of fast movement, their humorous attempts to wedge themselves into small spaces. If your children can let them be tortoises, they will gain new perspective on their own place in the natural world. What do you think? Does having a tortoise appeal to you? Share your thoughts in the comments!